childhood sandwich, a peanut butter and jelly! Now that the kids are back in school, I'm back to planning quick and easy breakfasts for them during the week. The biggest problem I have is that my kids aren't hungry first thing in the morning. They don't feel like eating until mid-morning and, in fact, on the weekends we probably don't have breakfast until 10:30 or 11:00. This presents a problem when I'm pushing for them to eat at 7:00 am! Lucky for me, I found a way around this issue. I get them to drink their breakfast! I've been making smoothies for a long time, so I decided to create some fun versions for quick breakfasts. 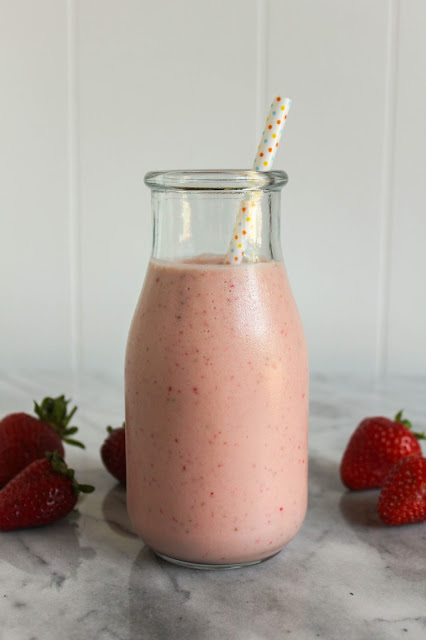 This PB & J Yogurt Smoothie is definitely a favorite, and currently the most requested in our house every week. Although the name suggests there is jelly in this smoothie, there really isn't. Fresh strawberries are the "jelly" here. And with an added heaping tablespoon of peanut butter, this flavorful smoothie tastes just like my favorite sandwich. 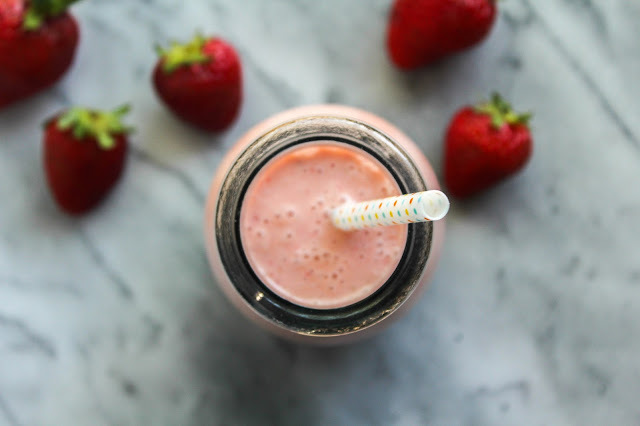 Full of vitamins, protein and fiber, this smoothie is healthy and will give kids the energy they need to start their day off right! And of course, this smoothie is perfect for moms and dads, too! Add all of the ingredients to the container of a blender, in the order listed above. Blend on high until smooth. Add additional ice cubes if you prefer a thicker smoothie. 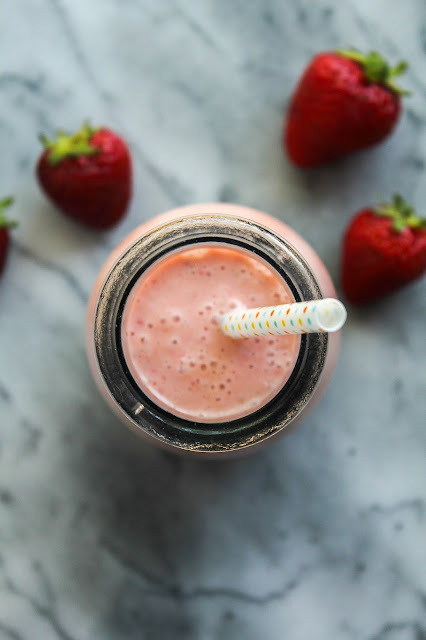 Be sure to check out the Milk Means More Smoothies & Beverages section for more delicious recipes! I'm proud to partner with the United Dairy Industry of Michigan and I thank them for sponsoring this post! I was compensated for developing a recipe to celebrate Better Breakfast Month. As always, all opinions are my own. UDIM, branded as Milk Means More, is the umbrella organization for the American Dairy Association and Dairy Council of Michigan. Their goal is to promote Michigan’s locally produced dairy products and reconnect consumers with the people behind their food.